What Makes a Data Scientist Great? 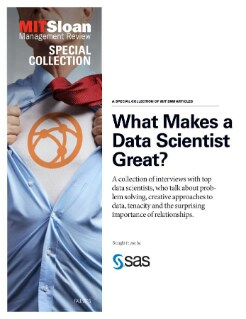 This special collection of interviews sponsored by SAS includes discussions with top data scientists from General Mills, Kaggle Inc. and the director of the MIT Sloan Center for Information Systems Research. Each of the three articles includes discussions about problem solving, creative approaches to data, tenacity and the importance of relationships.